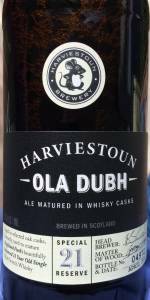 Home Beers Harviestoun Brewery Ltd.
Ola Dubh Special Reserve 21 | Harviestoun Brewery Ltd. Aged in casks that previously held 21 year old Highland Park Whiskey; wooden sweet flavour with bitter chocolate, smoked peat moss and a touch of vanilla. Appearance - no head at all over a clear, extremely dark brown body. Aroma - Rich molasses, a little coffee, raisins and plums, woody oak, hints of smokiness, No booziness. Taste - Strong woodiness, faint molasses, a little smoky, light bitterness, and a hint of whiskey and vanilla at the end. Mouthfeel - deceptively smooth and easy drinking. Overall - trying the entire series, lowest to highest. They have been getting better and better. This one is VERY good. Perhaps this bottle is past its prime (April 2014), but this is surprisingly mild and light given what it is. There are peat flavours to be sure, as well as some vanilla and oak, but it is all a bit thin. Minimal carbonation, which contributes to the thin impression. A sticky finish. Lovely complex nose, very nuanced. Cherry, oak, vanilla, coffee, smoke. Pitch black appearance. Taste has notes of dark malt, a smooth creaminess, cherry notes and whisky notes. Well constructed. Easy crisp finish, mild carbonation. I feel like this beer is beyond epic when it is most fresh. But atm it is still a wonderful beer. No serious head, just slight lacing at the edge. Pitch black. The most toasty coffee and malt aroma imaginable. Whisky and wood climb through the amazing coffee and malt. A superb and complex aroma that blows many BA stouts RIGHT OUT OF THE WATER. Taste is even better. Roasted malt, vanilla, Cacao, and PEAT. Jesus this beer embodies the peaty character of scotch. Amazing absolutely amazing. Sadly it's a weird sharp peak in flavor, not so much a smooth start and finish all the way down the gullet. .
Mouthfeel is moderate. Nothing notable. Carbonstion is subdued by age I think. 330 cc bottle dated April 2014, so it' almost 3 years old. L: Pours dark brown/black with no head. O: Not a bad beer, but rather disappointing given the price and hype for the beer. I was expecting more. Maybe this beer doesn't age well. A 330ml foiled and capped bottle, bottle no. 00214, bottled in April 2014, and best before end of May 2017. Poured into a snifter glass. Appearance: A clear dark brown colour with pretty much no head and only very sparse spotted lacing. Aroma: Chocolate, whisky, wood and vanilla with maybe a touch of coffee. Taste: Dark chocolate, roasty malts and coffee bean, whisky and vanilla with a hint of sweet dark fruit, raisin, plum and prunes on the finish. Mouthfeel: Medium bodied with low carbonation. Overall: Nice roastiness and vanilla with subtle but clear whisky notes makes this go down easy. Definitely on the lookout for the other years now. Reviewed from notes. Had on-tap at Rendezvous in St. Augustine. Served in a mini-pint glass. A: Barely translucent dark brown, with a thin tan foamy head and just a few bubbles rising up the side of the glass. S: Whiskey, woody barrel, vanilla, and rich malts. Mild chocolate, subtle spiciness and clove as well. T: Follows the nose well. Whiskey up front, with sweet roasted malts and vanilla as well. There's some subtle smoky barrel char here also that I didn't pick up on the nose. Some dark fruit character - raisins and prunes - and a sweet leathery flavor as well. Sweet with mild whiskey afterburn in the hang. M: Medium body, with relatively low carbonation but not quite flat. Not overly hot in the context of style and the listed ABV. O: I rather enjoyed this one. My favorite beer I've had from them so far. It wouldn't be something I'd reach for every day, but I would be more than willing to drink it again. 11.2 oz bottle. bottle no. 02677. April 2014. A: a gentle brown hued fizz tops this very dark, very opaque brew. S: dark chocolate and warm alcohol. T: a decent amount of booze. sweet and savory. a little bit of sweet butterscotch, but I am not convinced that it is diacetyl. not sure if I am getting barrel character or just the booze from this brew. bitter earthy finish. M: moderate amount of carb. full body. D: overall this is pretty easy to sip on and very smooth. unfortunately I think the scotch character is a bit diminished in this one, practically invisible. definitely disappointing considering the reason this was purchased was to get some scotch in as well! independent of that, this is a smooth easy drinking old ale. Less richness in aroma although more smoke and scotch on the palate compared to 12 and 18. Maintains its gritty feel and lack of head and carbonation. Ola Dubh Special Reserve 21 from Harviestoun Brewery Ltd.